I'm sorry for my brief absence, but the end of last week left me a little under the weather and unable to sit at my computer or feel very inspired. But as you well know by now, when I'm anxious, sad, celebrating or sick, I bake. And lucky me, home in Pennsylvania, my mom was packing a fancy dinner of Osso Bucco to take to friends in Maryland and had yet to choose a dessert. 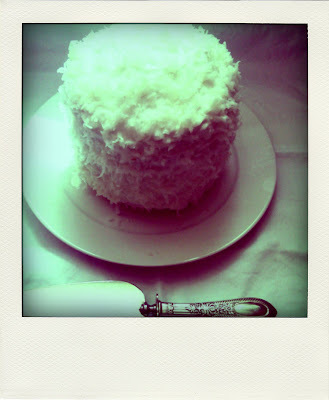 As usual I elbowed my way in there and decided on coconut layer cake. I said sure ! 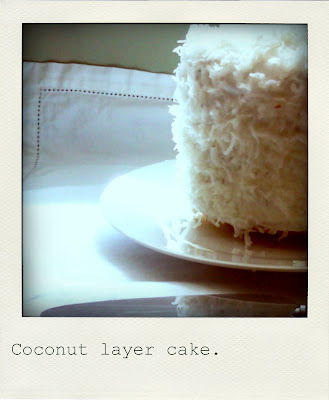 How about coconut layer cake ?! Whoops. It just sounded fresh and and spring like. Decadent enough to stand up to Osso Bucco. Airy enough that guests can still get up from the table at the end of the night. Why does a little six inch cake feel regal and decadent ? I don't entirely know, but (unfortunately) I've had time to give it some thought. one, its in layers. Layers people. We're not talking your standard two-layer every-birthday-cake-you-ever-ate layers. We're talking 3 cakes, split and layered with coconut cream filling in between. That's six layers + cream. Little 'round she may be, but short she is not. Height is almost always regal. Second ? 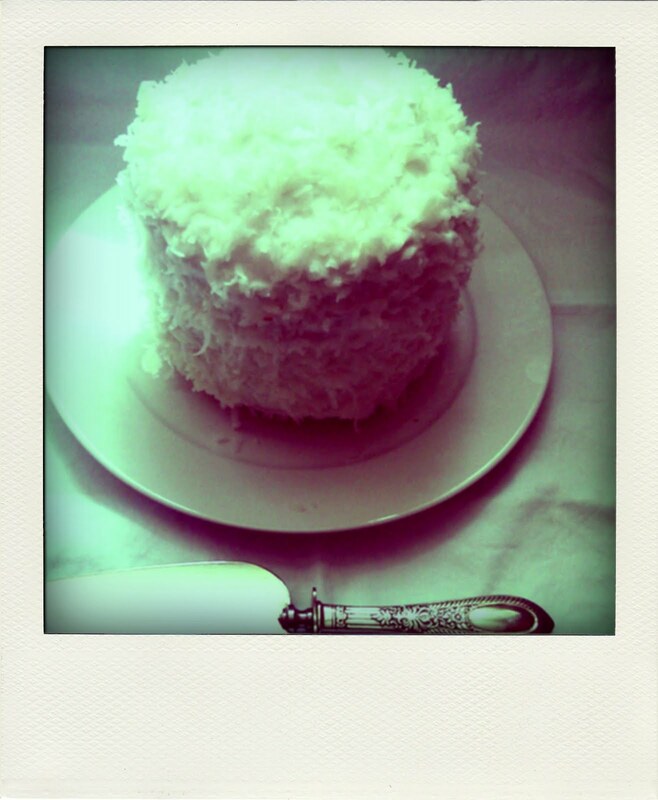 Coconut flakes. Yes, these flakes are decadent. I was daydreaming about these sweet shavings and thinking why do they feel so angelic ?? Of course it occurred, it is, after all, called Angel Flake Coconut. I guess I'm not the first person to daydream in this fashion. The cloud like, snow flake, petal appeal has sent others dreaming of the angels above. And so on the bookends of feeling awful I was able to bake and then dress this sweet little thing on a little round, clean, white plate. As a warning, sweet is no understatement. This cake is not for the faint of heart, rather for sweet tooths like me. And my dad. And Liz. And my sister Kathryn. Martha was, not surprisingly, my source for this one, and you can find the recipe here. While I wait to learn why my body is acting up, there might be more baking in store. Even if it does mean two stops to supply stores to learn 6 inch cake pans are not standard or carried (luckily had one !) and multiple grocery stores for the right ingredients.